Amazon Echo can control smart home devices (Philip Hue lights, Belkin’s WeMo switch system). But those things are pretty expensive. If you have Infrared remote control lights (or other), this project brings these device to smart home device. Talk to Amazon Echo "Alexa, tell pi home lights on"
Connect IR reciver LED signal to GPIO 18 and IR LED to GPIO 17. Point your remote controller and push any button. If you see output like following, it means setup is good. 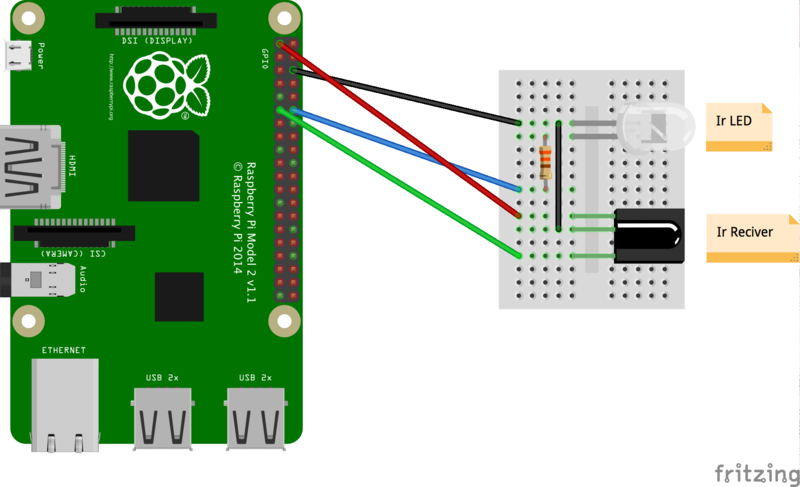 Repeat this step for the button you want to use on Raspberry Pi. Create /etc/lirc/lircd.conf and paste parsed signal. If the signal is longer than 80 characters, write it to the next line. "Living_light" is the name of remote controller. If you changed this name, rewrite the `raspberrypi/iot_shadow.js ` . "light_all" and "light_off" is the name for the parsed signal. In the sample source, these name are linked with lambda function. If your config is correct, Raspberry Pi becomes a remote controller. This sample only use AWS IoT device shadow. Just setup the Thing and certificate. Follow the steps in AWS document to add the thing and certificate. Do not forget to download certificates. After creating the Thing, add device shadow state. This Lambda function update AWS IoT device shadow. So attach a role which have correct permission like following. Add a new skill with following samples. Add your Lambda function ARN. Now you can test your skill. Fix the Lambda function APP_ID variable with your skill application id before testing.